I found out yesterday morning that, as of December 31st of this year, my current position at the University of California Observatories will be excised due to the sad fiscal condition of higher education in California. I'm in good company, with something like 20% of working-age people in the US already out of work and likely to remain so for some time to come. Trouble is, as so many of you know, if you don't have a benevolent employer, or if you don't make enough to be able to afford reasonable health-care insurance, you're doomed to live in fear of what may come if you are already ill, or inevitably as you enter your golden years. [Just ask my bud Dwight Simons if there's really any gold in them thar years.] Nevertheless, I'm luckier than most of the other un- or under-employed in the US--even though I've lived outside my native Canada since 1988, I can go back there any time and once again enjoy living in a country with universal, affordable, health care. Believe me, if I were a spiritual person, I'd be thanking my lucky stars or counting my blessings, you name it. But my return to Canada is made problematic by the recent divergence of my partner of 22 years and yours truly. I wouldn't hesitate to hie myself back to the Great White North were it not for one important feature of my life here in Surf City--my amazing 17-year-old daughter. She lives with her mother, and since September 2011 I've lived three blocks away. I've stayed close because I choose to continue to have something like a normal life with my daughter, if only until she leaves Santa Cruz for Prestigious U. in the fall of 2013. So, I'd prefer not to pack my bags just yet. Yet, if I'm unable to find alternative employment on the UC Santa Cruz campus, it's highly unlikely [a virtual impossibility] that I'd find another employer who offers the kind of benefits that I and my family have enjoyed for the last 8 years while I've been with UC. In that case, going back to Canada might be my only choice. I simply will not live in fear of the financial consequences of contracting any illness worse than a bad cold while living in the US without health insurance. No matter what your political stripe, if you live in the US, take it from me, it's far better living somewhere where everyone, regardless of their means, has equal access to virtually free, adequate health care. Were I you, I'd have been on the battlements decades ago, alongside the likes of Ted Kennedy, fighting for universal health care in the US against those fools and stooges of the insurance companies, the medical establishment, and of course, big pharma. It will never truly be a land of opportunity as long as there is one person who hesitates to visit a doctor until their illness is well-advanced and complications have set in, simply because they can't afford it. There is a bit of sunshine in all this. Regardless of where I'm living hereafter, and for as long as I'm still in this mortal realm, I might just be able to afford to retire. Just. Two benefits will come from that, as I see it. First, I won't ever have to work for 'the man' again. 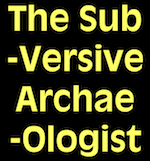 Second, and perhaps even better, I'll have more time to tweak your ears on the Subversive Archaeologist. Ç'est une idée magnifique! N'est-ce pas? Je crois que oui! Au revoir. A la prochaine, mes amis.